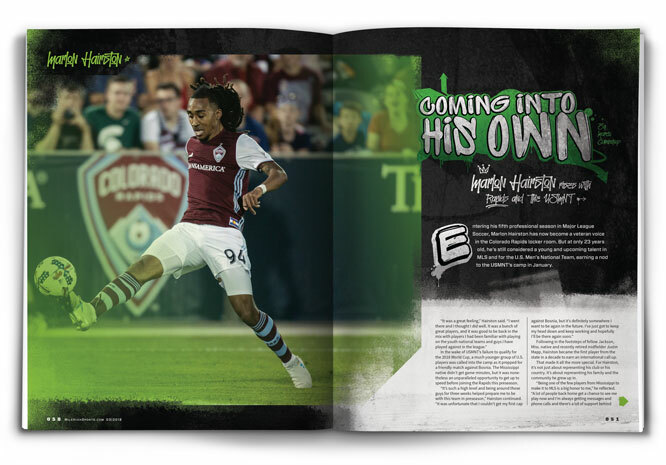 Now in his fifth professional season in Major League Soccer, Marlon Hairston has become a veteran voice in the Colorado Rapids locker room. But at only 23 years old, he’s still considered a young and upcoming talent in MLS and for the U.S. Men’s National Team, earning a nod to the USMNT’s camp in January. In the wake of USMNT’s failure to qualify for the 2018 World Cup, a much younger group of U.S. players was called into the camp as it prepped for a friendly match against Bosnia. 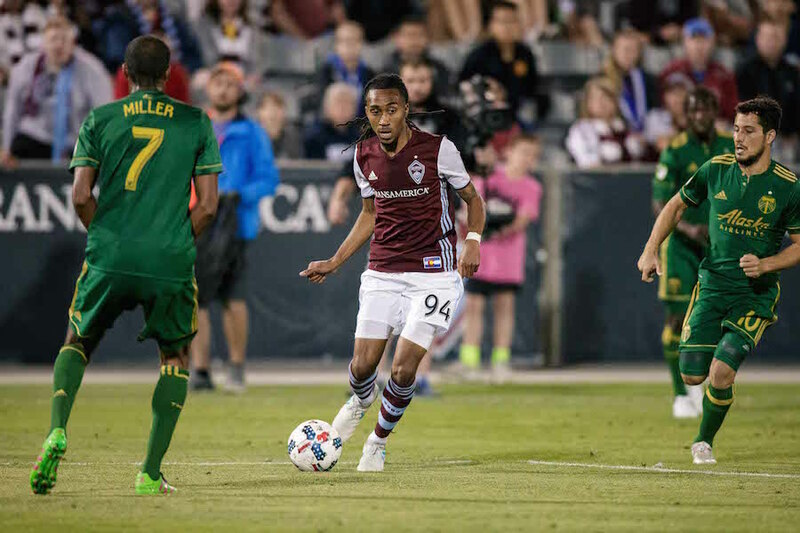 The Mississippi native didn’t get game minutes, but it was nonetheless an unparalleled opportunity to get up to speed before joining the Rapids this preseason. Following in the footsteps of fellow Jackson, Miss. native and recently retired midfielder Justin Mapp, Hairston became the first player from the state in a decade to earn an international call up. That made it all the more special. For Hairston, it’s not just about representing his club or his country. It’s about representing his family and the community he grew up in. It was a way of paying back that support, but it was also a culmination of the work he’d put in during the season prior. After struggling with injury at times earlier in his professional career, Hairston put together his most complete campaign in 2017, playing in all 34 games (29 starts) matching his career high with three goals while adding four assists. Even more impressive was the fact that the natural midfielder spent the majority of his 2,605 minutes logged in the right back position, one he’d been gradually picking up over the course of the past few seasons in Colorado. Aided by team captain Tim Howard and former head coach Pablo Mastroeni, Hairston was able to pick up on the defensive nuances of the game and become a more complete player. Howard has high praise for the youngster, but at the same time urges his teammate to keep his head down while maintaining perspective. Hairston also holds Mastroeni in high regard, often picking the brain of the man who cut his teeth as one of the better defensive midfielders in MLS during his 18-year playing career with the Rapids and the USMNT. Despite Hairston’s positive career trajectory, it wasn’t all rosy for Colorado in 2017. Unable to produce results, the club sacked Mastroeni in early August. Hairston and many Rapids players were left devastated in the wake of the firing. With 2017 now behind them, the Rapids enter the new season with a new head coach, new players and a new outlook. Recently hired manager Anthony Hudson has been relentless this preseason, but has also quickly earned his players’ respect, including Hairston. Hudson’s emphasis on the teaching and learning process has been vital for his team adapting to the 3-5-2 formation the 36-year-old head coach used in New Zealand. It’s a system in which a player like Hairston has the potential to thrive. Instead of being positioned strictly as a midfielder or fullback, Hairston is likely to slot in as a hybrid of the two positions – a wingback who can contribute on both ends of the field depending on the needs of the game. Having experienced the MLS Cup Playoffs just once in his career thus far, Hairston has experienced as many ups and downs as any young player making his way in MLS. But that small taste of postseason success is something he’s hungry to replicate year in and year out moving forward. “It’s been a long journey, but these seasons fly by,” said Hairston. “Making the playoffs just once in four seasons is something I’d like to improve on. It’s definitely our goal each season to make the playoffs. I think that’s what we’re all here fighting for and it should be the bare minimum we ask of ourselves.